Agreeing with the notion that public policies are “whatever governments choose to do or not to do” (Dye, 1987, p. 1) eventuates in breaking down the academic field of public policy to the study of decision making. Whether public policy is indeed in its essence the study of decision making or not is however part of a different debate that this essay will not delve into. Nevertheless, noteworthy here is that questions such as 'who are the decision makers? How and why do they take the decisions they are taking?' have been leading research questions in public policy sciences. One theoretical framework policy scholars have long used to give answers to the questions was the rational choice theory. The rational choice theory bases on the anthropological assumption that human beings are "economic men", or "Homo economicus" (Parsons, 1995), implying that human beings are "calculating self-interested individual(s)" (p. 272). Likewise, applied to public policy, it argues that choices are made rationally and objectively: Decisions are outcomes of comprehensive economic calculations in which a certain problem is clearly identified, all available information is gathered, all possible courses of action are taken into consideration, and the most effective or the most efficient solution is chosen. (Smith and Larimer, 2009, p. 49) However, many scholars regard this model of decision making as rather an idealistic model unfit to be implemented in the real world. Simon and Lindblom are two prominent critics among these scholars. Both challenged the "ideal type" of rationality by pointing out its empirical boundaries and limitations when in reality policy choices are made. 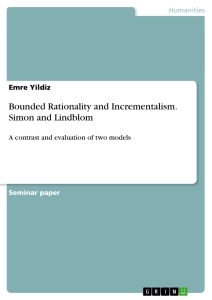 This essay is aimed at achieving three things: First, to introduce both Simon's notion of "bounded rationality" and Lindblom's concept of "incrementalism" as two alternative models of explaining decision making in public policy as opposed to how it is illustrated by the rational choice theory. Secondly, to compare and contrast both models with each other to examine what important commonalities and distinctions they bear. Lastly, to answer the question to what extent Simon and Lindblom are themselves grounded in reality after dismissing the rational choice model as unrealistic. For this purpose, the procedure of the essay will be as follows: We will first examine Simon's theory of 'bounded rationality'. We will then proceed to the theory of 'incrementalism', forwareded by Lindblom. In the third step, we will contrast 'bounded rationality' with 'incrementalism'. After summarizing what both theories have showed and in what particular aspects they are in line with each other, the essay will turn to a critical evaluation of Simon's and Lindblom's approaches to examine their degree of reference to reality. In the end, the essay will give summarize the findings and point to criticisms and further research. Even though the rational choice theory is at the basis of Simons and Lindbloms critical works, for the sake of not to overrun the scope of this essay, we will not delve further into the arguments of rational choice model or depict the anthropological debate held between the two camps, namely the reason-rationality context and the passion-instincts context. The essential arguments of the rational choice given above will suffice as background information to comprehend Simon's and Lindblom's arguments. In his work "Administrative Behavior" (1957), Simon contests that policy actors operate completely rational. His core argument is that human beings, when they face a problem and are required to act, are prevented from behaving in a fully rational manner due to limitations in their cognitive capabilities and to environmental constraints, even though they are rational in their intentions. Policy actors, taken as individuals, face the same limitations: Instead of engaging in exhaustive calculations on costs and benefits or collecting thorough information, they simply adapt to the given situation that enables them to solve the issue in a "satisficing" way. (1957, p. 76). The reasons Simon (1997) gives as to why complete rationality is impossible to attain can be summarized as follows: Acting rationally presupposes that one has not only complete knowledge but also an anticipation of the consequences a taken choice will have. Knowledge of consequences, however, is subject to temporariness. Further, a full rational decision requires taking into account all possible and available options. The latter is, however, in actual behavior never the case, since the entire range of alternatives is hardly ever fully exploited. (Simon, 1997, pp. 93-94) In other words, time and organizational constraints, cognitive limitations such as limited information processing capabilities, and attention span makes it "impossible for the behavior of a single, isolated individual to reach any high degree of rationality" (Simon 1997, p. 92). "Laurence is not happy, because she does not choose to be happy." The character of Laurence in Simone de Beauvoir's "Les Belles Images"
Simone de Beauvoir’s Critique of D. H. Lawrence’s "Phallic Pride" in "Women in Love"
Native Genocide and American Imperialism in Simon Ortiz’s poem "From Sand Creek"
Consumer Behaviour. Does Rational Addiction exist?